It's Crossroads quilt along time again! We're up to the third month, and making the "Friendship" block. I really like the circular, almost ring-like design. And it's loaded with flying geese! Crossroads is the annual charitable quilt along sponsored by Fat Quarter Shop and Moda Fabrics. The monthly patterns are free, and a donation of $5 (or more) is requested for March of Dimes. It makes me happy to know that we are sewing for a great cause. You'll find the block pattern here, a new video tutorial with Joanna Figueroa and Kimberly Jolly here. Also check out the special Jolly Jabber Crossroads quilt along blog here for lots of great information about the prior month blocks. You can use your own fabrics, or make blocks just like mine with this kit featuring the Strawberry Fields Revisited collection by Fig Tree Quilts. Hello quilters! I've missed chatting with you! The past month has been full of real-life work activity, and that's involved preparation for client presentations, an action-packed trip to New York and an upcoming trip to Phoenix and Scottsdale. I'D RATHER BE QUILTING! In between all this craziness, I've managed to squeeze in a few minutes to sew this month's blocks for the Fig Tree Mystery Sampler BOM. I love those Homestead house blocks. Remember how I made the large Homestead quilt a few years ago? It was just quilted by Melissa and I'm working on the binding. So of course I was more than happy to make more Homestead houses! Ok, about these 4" basket blocks. They're cute, and they're small. I think that the aqua basket with the busy background looks a little blurry, but it's done and it's a keeper! And now about that trip to NYC last week! Here's the view from my hotel window. That's the LIpstick Building on the right. It's an oval shaped skyscraper, and it's and rosy colored... like a lipstick. The building in the center is my employer's headquarters. Staying in a hotel in the city that was my home for 30 years was just surreal. This was my first return trip since September. I dropped my luggage at the hotel and immediately hopped on the subway to go downtown for lunch and some quick shopping. What made it feel weird was that I acted like a New Yorker, but it was no longer my home. It was fun to run around to my favorite places, and I'm glad that I was able to do that. I even ate dinner at my favorite burger place near my old apartment. (And I walked by my old apartment building. What a dump. LOL) My big purchases? A used, out-of-print cookbook and a bunch of imported pasta from Eataly! I was happy when my seven meetings had ended and I could get on a plane and leave. I guess home really is where you make it - or, home is where you cook your pasta! And now I need to pack that suitcase again. The cats will not be happy. But I'll be back on Friday with the latest Crossroads quilt along block! So, I made two blocks in November (you can read about them here), and two blocks this week. This month's blocks have the exact same construction, and very similar fabrics. Two by Two is a series of patterns which will appear every two months in Quick Quilts magazine this year. The blocks each use preprinted scallop fabric for the outer flower petals, and then it can be anything goes in the center! I'm using an assortment of happy prints from Pam Kitty Morning (some are fairly current and some are from prior seasons) mixed with Sunrise Studio prints. I'm sticking to red and pink blooms with just a bit of sunny yellow, although the scallop fabric also comes in green, periwinkle and pewter. Here is the magazine that you'll want to look for on your newsstand or local quilt shop, or you can order a copy here. I love that quilt on the cover, too, and I even have those exact fat quarters! I just can't help myself! I'm currently working on FIVE of them: Fig Tree Wool, Fig Tree Yuletide Christmas (from last year! ), Fig Tree Crossroads (new blocks are coming this Tuesday), Lakehouse Two by Two (help, I'm falling behind), and now, Fig Tree Mystery Sampler 2016. I might need an intervention soon. Somebody please stop me from signing up for any more BOMs. These pics are all from the Fig Tree Mystery BOM. Isn't that star cool? It's from a pattern called Sweet Sugar Swirls. No templates or Y seams, just some creative cutting with the angle lines on your ruler. I'd really like to make a whole quilt full of them, but you know... I've got other blocks that need to be sewn! The individual Sweet Sugar Swirls pattern is available here. February's fabric/pattern pack had instructions for a lower case "a" but I quickly realized that if I reversed the pattern I'd have a lower case "g" block! I flipped the pattern over, placed it on my lightbox and traced it from the back. It could also easily become other letters, too. Last year's Mystery Sampler BOM was one of my all time favorite quilt tops. I loved making it, loved the completed top, and I'm sure that I'll love the finished quilt when it comes back from being quilted by Diana. So, lots of love for that quilt. And that's why I didn't hesitate to sign up for this year's Mystery Sampler! But here's what isn't a mystery: the new block for the Fig Tree Crossroads sew along is coming on Tuesday. The blocks use Strawberry Fields Revisited fabric, and we're all sewing along to raise funds for March of Dimes. You can join us! Click this link for details. I'll be back in just a few days with those blocks. crossroads quilt along, AND the name game! Hi everybody! The Crossroads quilt along officially kicks off today and I am SO EXCITED! You know how much I love Fig Tree fabrics and quilt patterns, so do I really need to say more?! These four house blocks make me happy in so many ways. House blocks are one of my all-time favorites (like my pink house logo! ), and there they are in the sherbet-y goodness of Strawberry Fields Revisted fabric! I'm sewing with the kit, and for once, I am resisting the urge to make fabric changes. But you never know what the future might bring! Crossroads is a 10 month quilt along designed by Fig Tree Quilts and Fat Quarter Shop. We'll be making blocks for six months and then we'll put it all together in August and September. One of my favorite parts of the pattern is that after each step, the pattern tells you what the size of that sewn unit should be. It's a great way to make sure that your sizing is accurate throughout the construction of the block. I always take a measurement of my unit and make corrections if needed. And guess what? There are NO templates in the roof unit! And part of my love of house blocks comes from my very BIG interest in becoming a first time homeowner. I've lived in 18 different locations (there might be more, but I've lost count) and I've never actually owned a house. Maybe home #1 can be aqua and covered with big roses? The pattern download is free each month, but a minimal donation of $5 is requested for March of Dimes. Together, we'll raise funds to help prevent premature births. You'll find LOTS of additional information about Crossroads here - you'll see fabric requirements, a calendar of the blocks that we'll be making, and a list of the participating bloggers. And be sure to watch this new video with Joanna and Kimberly, where they discuss what "home" means, as well as a house block tutorial. Have you ever wondered where my name - Grey Dogwood Studio - came from? I'm playing The Name Game today on Cindy Wiens' blog, Live A Colorful Life. Learn all about how I came up with my moniker (it's more complicated than you might think!) and check out all of Cindy's other fun posts. Just click here to learn more! Well, my quilty friends, we are at a quilting crossroads. The Snapshots charity quilt along is nearly finished. It's been fun, right? I've seen SO many great blocks from everybody. My Snapshots quilt just returned from my longarm quilter, Kaylene just a few days ago, and now I can stitch the binding! And the generosity of the quilting community has really been amazing - together, we've raised $38,000 - nearly double the original goal. That's awesome (and I don't use that word very often). We all need another sew along! Next up is the 2016 Crossroads charity quilt along. And omigosh it features my all time favorite fabric collection, Strawberry Fields Revisited! Just look at this strawberry-licious fabric. You can read all about Strawberry Fields Revisited here. And yes, I was one of those people who asked/begged Fig Tree Quilts and Moda Fabrics to pleeeease reprint the collection. There are some new prints and colors this time, along with the return of some favorites. Strawberry Fields Revisited will coordinate perfectly with any older Strawberry Fields that might be in your stash. Isn't this quilt perfect? It was designed by Joanna Figueroa and it's reminiscent of a vintage quilt. It's the kind of quilt that I always hope to find at a consignment shop, but of course, I never do. It's definitely a future heirloom for today. The "crossroads" theme is an excellent way to describe the year that I've had. Many of you know that I was recently at a crossroads with my housing, and we made a huge decision to relocate from NYC to Indiana. Sure, I wanted more living space and clean air and a modern kitchen. I had many doubts about moving. I knew absolutely nothing about Indiana, and it doesn't even have a tour book! But the decision to move was made very quickly, and all I can say now is... why didn't we do this sooner?! My quality of life is SO much better. I miss almost nothing about NYC, and that really surprises me. My boss told me today that I always readily embrace change and I thought "really, I do?" So this major crossroads changed my life for the better. Next year's quilt along will benefit March of Dimes, which helps families with premature babies. It's surely a very worthy cause, and I'll be learning more about them throughout the year. I am confident that quilters can make a difference. We did it this year, and we can do it again. Okay, so here are the details. The eight month sew along will start in February 2016. Fat Quarter Shop will post a pattern download on the 15th of each month. Each pattern is free, but a $5 donation to March of Dimes is requested for each pattern download. A quilt kit with all the fabric you'll need is available here, and there's also a pieced backing kit. Designer Joanna Figueroa has shared a story about her own personal crossroads, as well as the inspiration for this quilt on her blog here. I do hope that you'll join me (and a group of bloggers!) as we sew together. I can't wait! Hi there! Did y'all enjoy/survive Thanksgiving? We took a quick, three day trip to see family in Ohio. We definitely spent more time in Cincinnati traffic than at the dinner table! We came home with LOTS of leftover turkey (thanks, Carole! ), so now comes the fun leftover part. So far, there's been a basic turkey dinner with newly made garlic mashed potatoes, turkey noodle casserole and 12 cups of turkey stock for some unknown future use (if you happen to have old Martha Stewart Living magazines hanging around, the recipe is in a February 1995 article on making stocks). What can I make next? I'm now back at home and back to sewing! Here's the FINAL Snapshots block called Walk In The Park. Never mind that I've probably only had a handful of picnics in the park... it's a cute block! You can find this month's pattern download here. And take turkey sandwiches on your picnic. My Snapshots quilt top has been completely finished and I shipped it out to Kaylene for quilting. She sent a sneak peek of the quilting today and it resembles loopy nautical ropes. I'll show it to you just as soon as it comes back to me. Kimberly and Fat Quarter Shop are now auctioning the signed, original Snapshots quilt on eBay to raise additional funds for St. Jude's Children's Research Hospital. Quilts from Anne Sutton of Bunny Hill and Pat Sloan are up for bidding, too. Get the full scoop and links to the auctions here. And I almost forgot something! I have two winners for the Quiltmaker 100 Blocks giveaway. Copies of the magazine are now on their way to Renee Lange and MaryAnn Scanlon. Congratulations! It's Snapshots quilt along month 11! I can't believe that this year's fundraising quilt along is almost over. 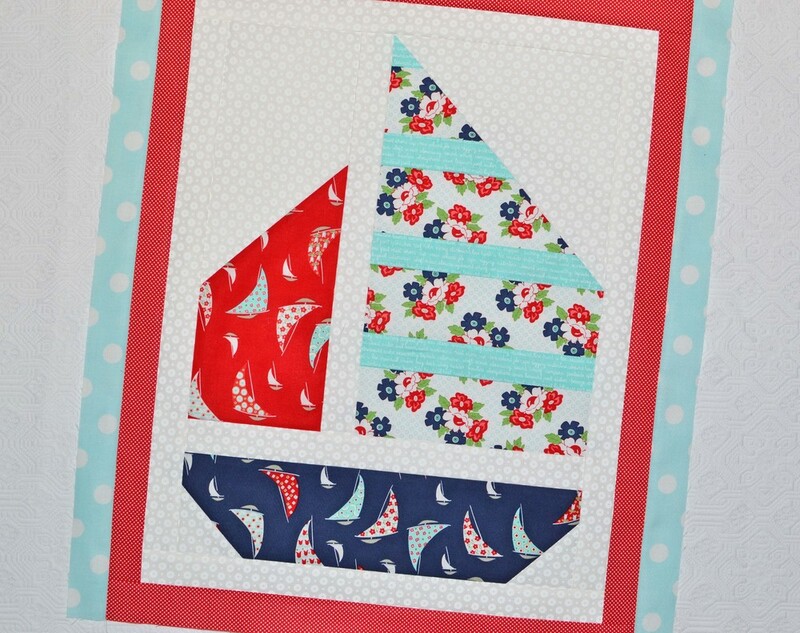 This sailboat was definitely the easiest and fastest block to sew. This month's recommended Daysail fabrics are just perfect. Kinda reminds me of those sailboats that I saw on my Florida trip last summer. So by now you know how to get the pattern, right? Head over to the Fat Quarter Shop's Jolly Jabber blog to download the pattern and to watch a tutorial video. Please consider donating $5 for the use of the pattern to St Jude's Children's Research Hospital. You might even want to start to do the photo border sashing on your blocks - see how to do it here. I'll be back tomorrow (really!) with a fun new baby quilt from the new Fat Quarter Baby book. Hint... it has strawberries! It's the Two by Two sew along! Holly Holderman (of Lakehouse Dry Goods fame) designed this quilt. It's a 7 part series, and the patterns will be printed in McCall's Quick Quilts throughout 2016. The first six installments will be blocks (each block comes in two coloways) and the final installment will be quilt assembly and finishing. The blocks measure a generous 12 3/4" unfinished. The flower blocks use an engineered scallop print to make the flower petals - it's the look of applique without all the fuss! For my flower centers, I'll be using an assortment of Lakehouse fabrics, but really, any stash could be used. Maybe you already saw the scallop prints in your local quilt shop and wondered how to use them... now's your big chance! The magazine is on newsstands and in bookstores now. Copies of Quick Quilts are also available here and here (I actually ordered one by mail because I'm impatient). A kit is available on the Quick Quilts website here. Or if you just want the scallop fabric to pair with your stash, I found the best assortment of colors here (you'll want the largest scallop print, not the medium or small versions). Wow, we are on month 10 of the Snapshots charitable quilt along! This month we are making a sporty red car on the way to the beach with a surfboard on the roof. The block is called "Gone Surfin." But wait... I have a tree on my roof! Ok, let me explain. I don't surf. I don't own a surfboard. But I recently "Gone to Indiana" in a new Suburu. And since this quilt is a snapshot of important moments in our lives, I thought about moments that are important to me. Christmas is important, with lots of significance as well as opportunities to decorate, eat and relax. So how about adding a Christmas tree to my car?! I'll tell you all about how to make a Christmas tree just like mine. First, a small disclaimer. Y'alll know that I'm not a professional pattern writer, but I think you'll be able to follow along. First, digitally drive over to the Fat Quarter Shop and download your free Gone Surfin block pattern (and please consider making a $5 donation for the use of the pattern to St Jude Children's Research Hospital here.) Build your car just like the pattern specifies. Now of course, you can go ahead and make the really cute surf board. But If you want to try a tree, here's how I made mine. For the "branches", you'll need to make 5 flying geese that measure 1 3/4" x 3" unfinished. Use your favorite method, like maybe (2) 1 3/4" background "sky" squares and (1) 1 3/4 x 3" green "branch" rectangle for each goose, sewn with the stitch and flip method. Or I used the Mini Fit To Be Geese ruler. Sew the 5 green flying geese together in a row. Next, build your tree trunk. I sewed a grey print measuring 1" x 5" between two background white prints measuring 1 1/2" x 5" each. Press towards the grey trunk. Now add the pieced grey trunk unit to the base of the flying geese branches unit. Trim the short end of the trunk so that the entire tree unit measures 3" x 10 1/2" - voila, it's the exact same size as the surfboard! Now add the "C" background rectangles (refer to pattern cutting directions) to both ends of the tree. It will now measure 3" x 16 1/2" long. Then add the completed tree unit to the car and you're done! In the craziness of my recent move, I completely forgot to show you last month's Quilty Cat block! (Chloe and Mia said that this is their favorite block, but maybe they're a little biased.) You'll find the pattern download right here, next to the car pattern. I've also started to add the sashing to each block as I sew. The assembly pattern is already posted on the Fat Quarter Shop link, so why not? It will make it a whole lot quicker to assemble the quilt top very soon! Oh, one more thing. There are still some Snapshot fabric kits available here, as well as a backing set. I've enhanced the kit with other Bonnie & Camille prints from my stash. Thanks for stopping by! Now go sew! Could this fabric be any cuter? Nope, I don't think so. It has that perfect retro, vintage look that I love. You'll also want to print out a copy of the tree block pattern. It's available for free here for a limited time, so get yours soon. You'll make just three trees. The bag serves another purpose. I lightly starch my fabrics right before I cut them. Now I know that the fabric in the bag has been starched, while the other fabric still needs to be treated. So, no guessing about which fabric I'm using. And see how great the red and green look next to the pink? Next Wednesday we'll make the gift box block! If you share your blocks on social media, be sure to use the hashtag #LittleJoysQuiltAlong. And look at who is sewing along! Such a talented group of ladies, and I'm happy to be included with them. I'm back on the farm again with the Farm Girl Vintage sew along. Wow, I had a lot of catching up to do! If I miss out on making two blocks each week I can get behind quickly. You probably know that I'm a little addicted to gingham. I try to put some gingham into every quilt if possible. So how perfect that last week's project was to make a "gingham" block! I even used gingham for the medium-toned print, so it's Gingham Squared. Or Gingham Gingham. Or Double Gingham. Now, of course, I want to make a whole quilt full of gingham blocks. The Fresh Pears and Feed and Seed blocks are fun, too. Ah, fresh pears. My friend Judi has a pear tree in her backyard and there's always a plentiful yield of green pears for everybody to take home. They're often hard and sour, but there are lots of them! And finally, the egg basket and crops blocks. Who wouldn't want to fill this basket with farm fresh eggs? The Farm Girl Vintage blocks might even have inspired a short trip that I took last week to the real farmland. Can you guess where I went? I was in Indiana looking for a new home! Can you believe it? Paul and I are leaving NYC for greener pastures... literally. We're trading Metropolis for Midwest! It was a quick decision, but after living in NYC for 30 years I'm ready for a change. And this will be a BIG change for sure. Imagine how excited we were to find an apartment that's three times the size of my current place, with all those "modern" conveniences that I lack in my current apartment - stuff like a full sized refrigerator, dishwasher and garbage disposal, washer and dryer, sliding door and balcony. And a walk-in closet. Plus green leafy trees and cute birds that chirp instead of big, ugly pigeons. Crazy, right? There are even THREE quilt shops in town (but none of them carry Moda fabric or Aurifil thread... what's up with that?) and one of them can service my sewing machine. We'll move at the end of July, but I intend to keep on sewing right up until the last minute. The movers will deal with our furniture, and we'll pack the cats and my sewing machine into the new car. I'll share my farewell message to New York with you soon. The move is now just three weeks away. EEK. Now back to the quilty stuff. The Little Joys sew along starts this Wednesday with that cute fabric by Elea Lutz. (Remember Elea's first fabric collection Milk, Sugar & Flower? She's back with a terrific Christmas collection.) The patterns will be free for a limited time only. I've got all the details for you in my previous blog post, or you can click on the Little Joys button in the right sidebar. See you back here on Wednesday! little joys quilt along starts soon! It's time for the annual mid-year Christmas In July quilting fest! So throw a log on the fire (ok, maybe not!) because the Little Joys Quilt Along starts soon! It's the perfect time to begin a small Christmas project. It's a small quilt (34" square) and the pattern is free! We'll have our quilts finished way before December! Find all the details here, including a handy PDF with fabric requirements, plus links to the other bloggers who will be participating in this quilt along. The pattern for the first block will be posted on July 8 so you have plenty of time to gather your festive fabrics! I'm so happy to be your cowboy tour guide for Farm Girl Friday, week 8! Or as I prefer to think of it, it's Farm Boy Friday! We are using the Farm Girl Vintage book by Lori Holt for the sew along. And today we are building a farmhouse block! The farmhouse is my favorite block in the Farm Girl Vintage book. I've always loved house blocks. They have that classic, vintage look, and they can be playful or sophisticated depending on your fabric selection. I've blended Ambleside by Brenda Riddle with Aloha Girl by Fig Tree & Co, both by Moda Fabrics. First, turn to page 27, then cut and sew, preferably with country farm girl music. I was super happy when I finished the 6" block for my sampler quilt, and I didn't want the fun to end. So I made another block, this time 12" and using Mistletoe Lane by Bunny Hill. Humm, I think it looks bare. How about if we add a topiary tree? But why stop there? Let's make another farmhouse and another topiary! I LOVE them! The two large houses are the beginning of the Farmhouse Lane quilt. The pattern is in the book on page 128. You'll need nine of the 12" houses, six trees and sixteen 6" blocks. I think it will be the perfect Christmas quilt full of gingerbread houses, ice skates (never mind that I don't skate, even though I stalk the Rockefeller Center ice skating rink every Christmas) and little Christmas trees. But wouldn't it also be a spooky fun quilt in Halloween colors? Or summery with red, white and blue? I really wanted to make a striped roof. It took me a few minutes to figure how to get the stripes all oriented in the same direction. So now let's talk about how to use stripes on your roof. Thanks for joining me today! I hope that you share your farmhouse blocks on Instagram. Be sure to use the hashtags #farmgirlvintage, #farmgirlfridays and #farmhouseblock when you post your blocks. And you can see all the fun projects that I'm working on, too. I'm @greydogwoodstudio. Now hop on over to Lori Holt's blog to see her Farm Girl Vintage blocks, and check out the other guest bloggers, too. The full schedule is on the Jolly Jabber blog here.